Area of real estate land plot is approx. 700 sq.m. 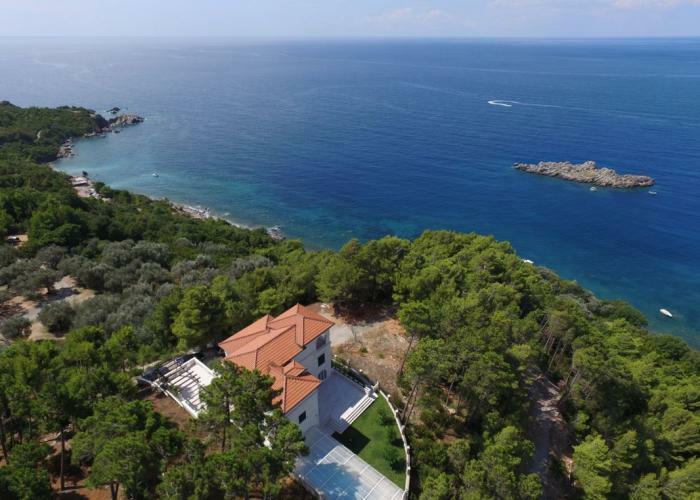 situated in a pine forest on a plateau of 70 m above sea level, 150 meters from the sea, to the left of St. Stephen.-the luxurious hotel island. 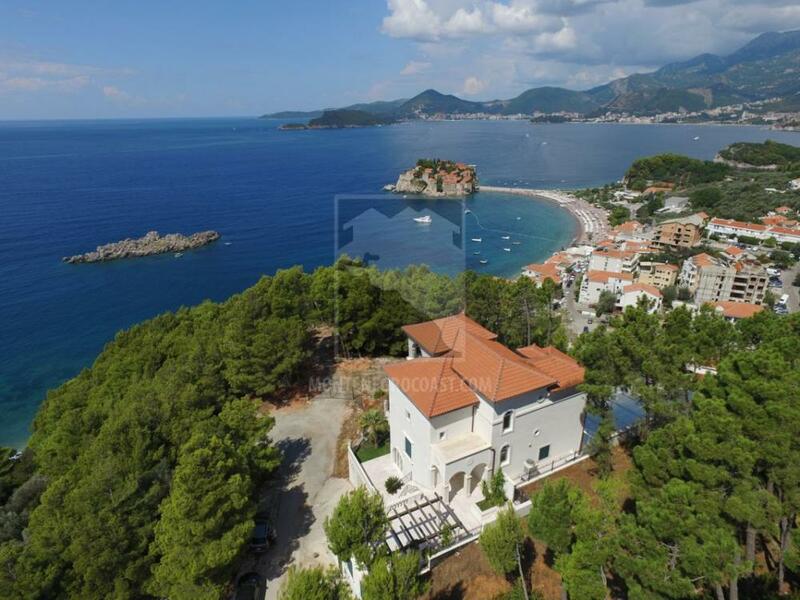 The total area of the Villa is 805 sq.m. 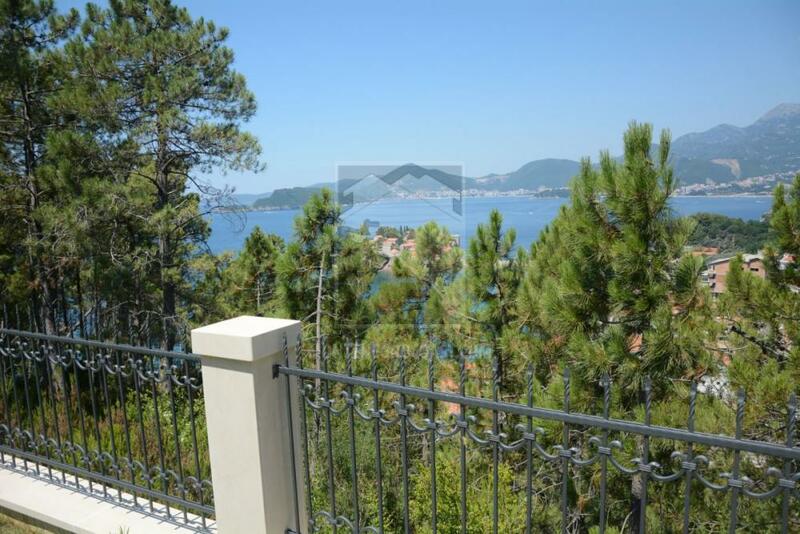 designed and built in accordance with current building standards and legislation of the Republic of Montenegro. 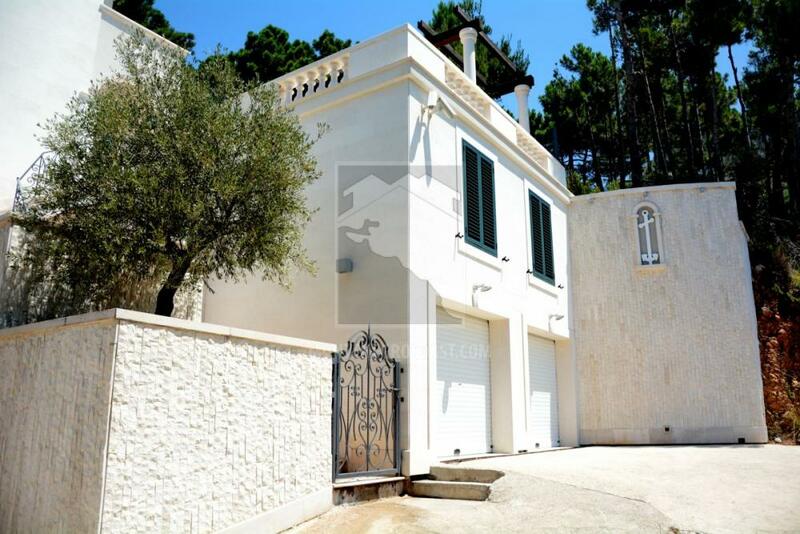 -Garage with space for 2 large vecicles with automatic gates. 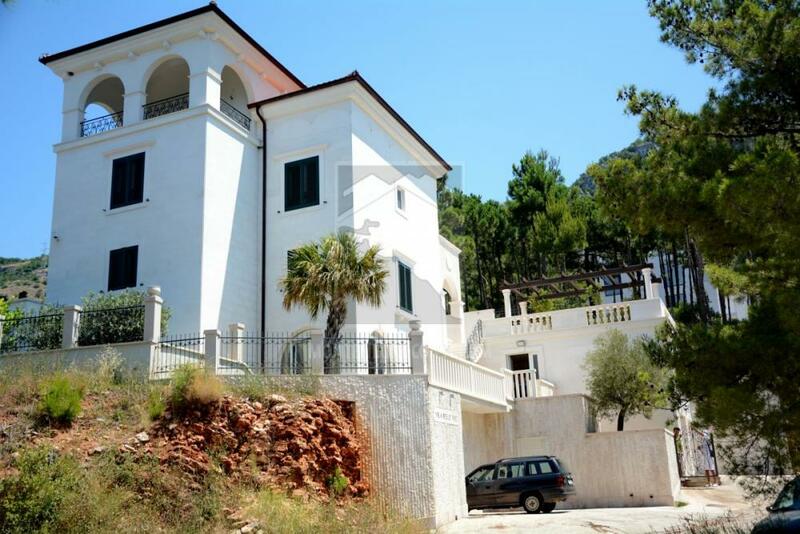 -Parking lot for 2 cars in front of the Villa. 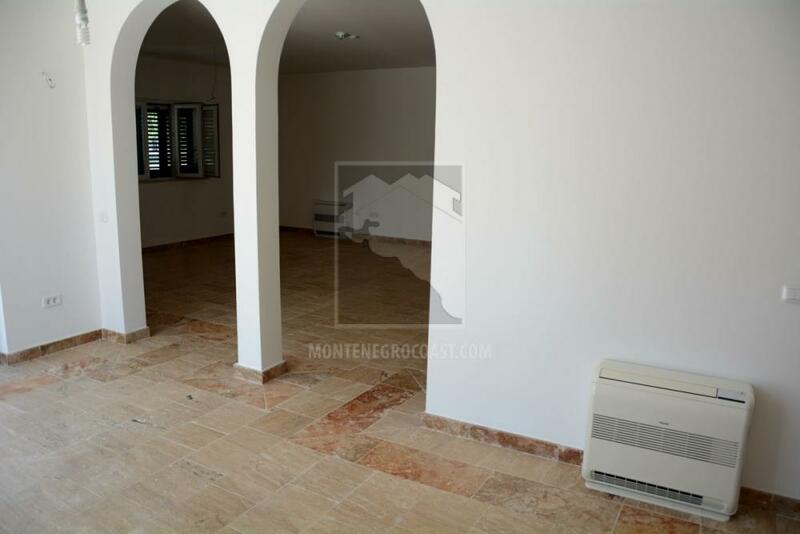 -Large storage room with entrance from the garage and parking lot. -Staircase from garage to 2nd level. -Main exterior entrance staircase leading from the parking lot to the 2nd level and servant/ security quarters, following to 3d. level with Villa main entrance and large terrace in front. 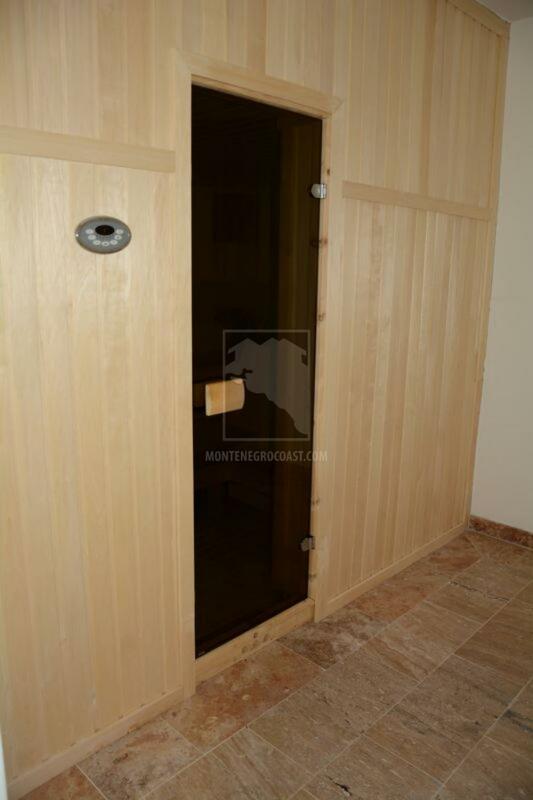 -Finnish sauna with lounge-resting space. -Wardrobe dressing room with 2 showers and separate toilet. 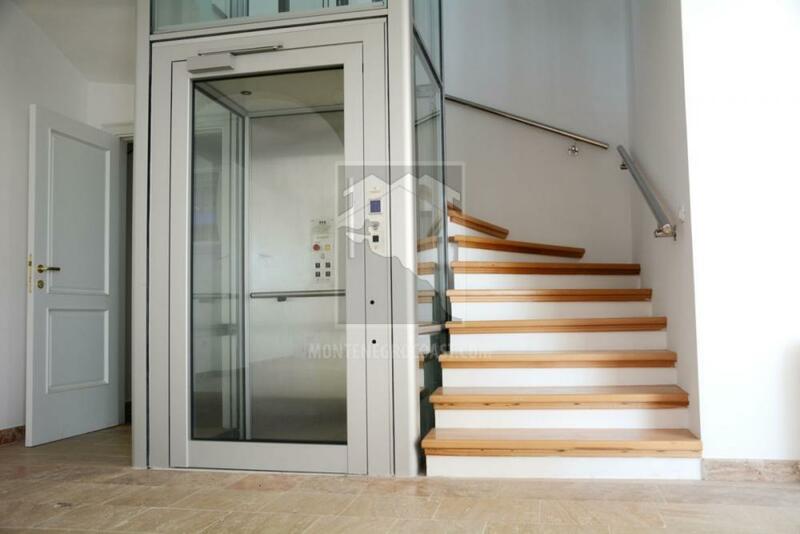 -Fitness room convenient for POWER PLATE training equipment and a separate entrance/exit to terrace. 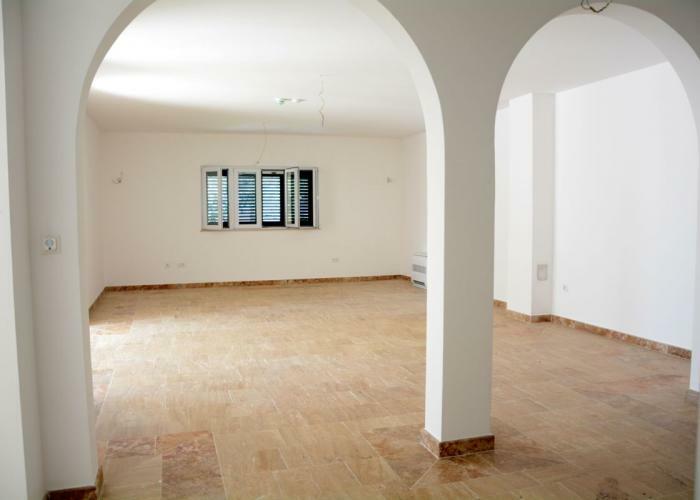 -Spacious hobby room (50 sq.m.) for leisure activities such as home theater, card games, billiards, darts, etc. -Utility room for washing and drying machines, ironing table, boiler, etc. -Large wine cellar capable of storing more than 1,000 bottles of wine with auxiliary space for cabbage, fruits and smoked meat storage. -Heated stone stairs made of Italian white (anti slip) marble “DOLIT” connecting the outdoor swimming pool under transparent dome to the recreational and leisure area. -Technical room with equipment servicing the outdoor pool under dome. -Space housing security camera (6 cameras) recorders and IT equipment. -Servant/security quarters (2-room apartment) with separate entrance from the garage and the main exterior staircase leading from the parking lot. If so required this accommodation can be used as quest quarters. The apartment consists of: bedroom, living room, kitchen and bathroom equipped with autonomous air-conditioning and warm water supply. -Central-main entrance to Villa with gallery. 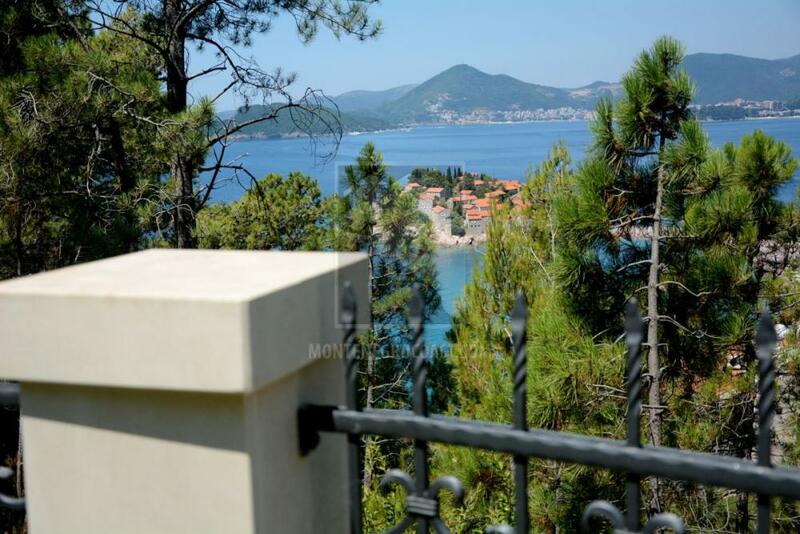 -In front of the central-main entrance (and above the servant/security apartment) is a large terrace-patio with solid white marble balustrades and columns, executed in the style of medieval Dubrovnik. On the left side of the Pergola is a long marble bench. 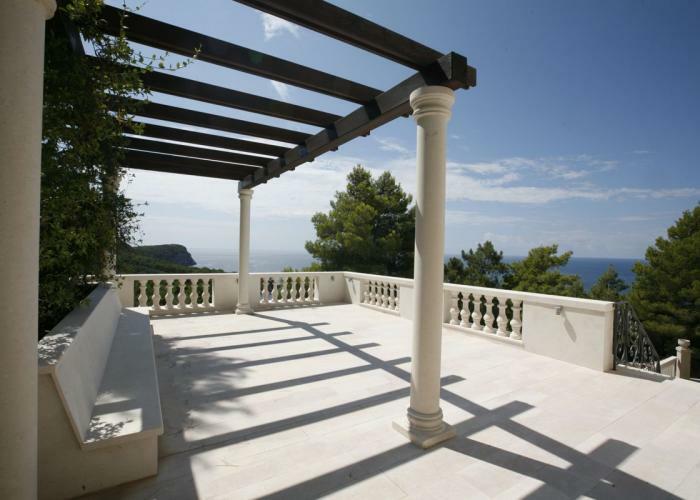 The wooden Pergola rests on 4 huge monolith white marble columns in the Dubrovnik style covered and twisted with an exotic native vine foliage. 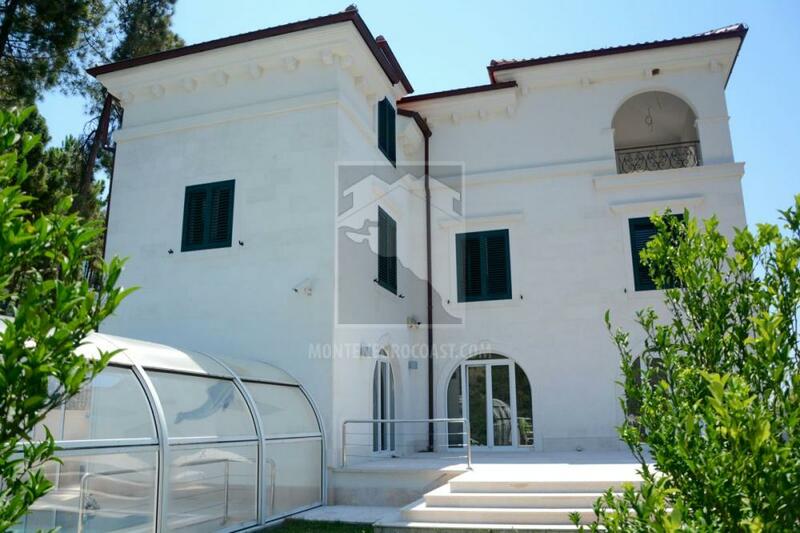 -Large open plateau covered in white Italian marble %22DOLIT%22, connected with the kitchen and living room via 2 large 2-winged arched glass doors, descending to the outdoor pool and grass lawn. 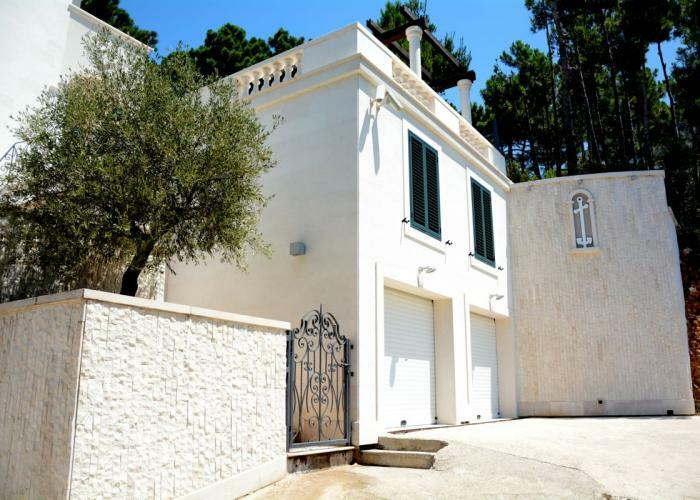 -Kitchen with dining area and with access to the front plateau. -Large living room with access to the front plateau. 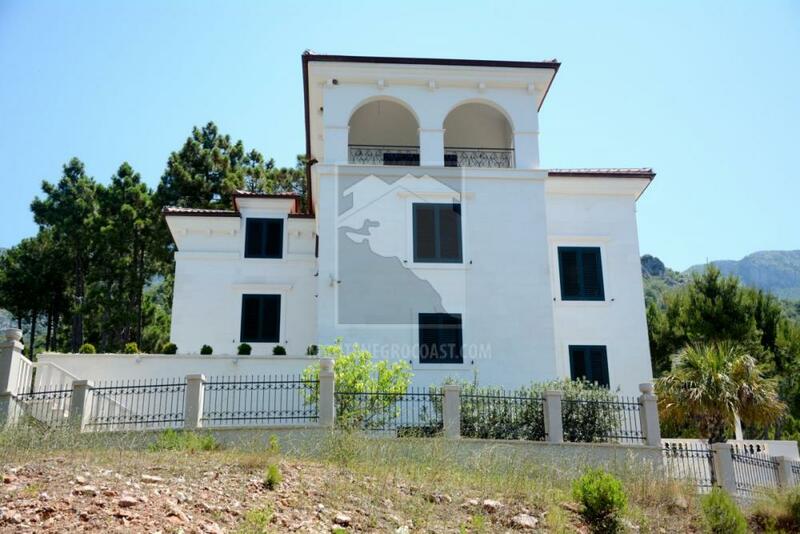 -Separate guest bedroom with en suite bathroom. -Pool Size is 9 x 4 meters. 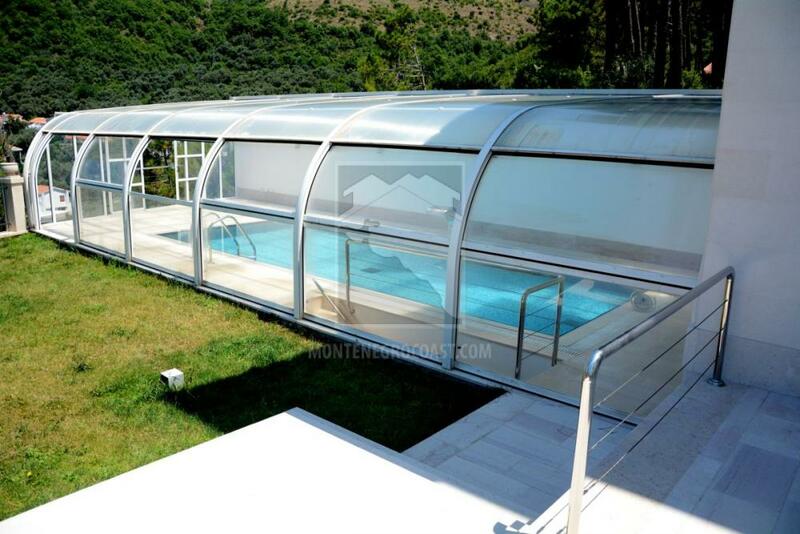 -During winter months pool is covered by transparent dome. -During summer months the front part of the dome opens toward the grass lawn and front marble plateau. 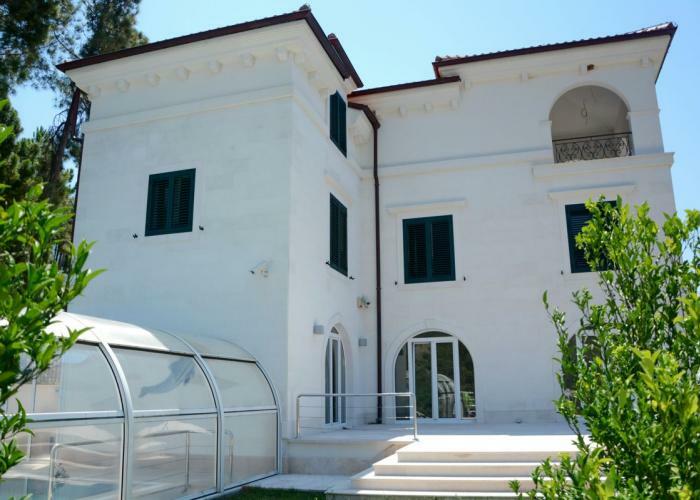 -The stone floor around the pool together with the steps leading to the pool from the recreational area, are of Italian natural white (anti slip) marble “Dolit” with independent electrical heating. -Water jet generator for swimming in water stream. -Underwater «LED» lighting with changeable color. -Remote control hand held unit for operating all additional equipment. -Automatic vacuum cleaner to clean the pool. -UV water filtration together with light chemicals allows for change of water every 5 years in the pool. -Water Heater/Cooler for energy saving. 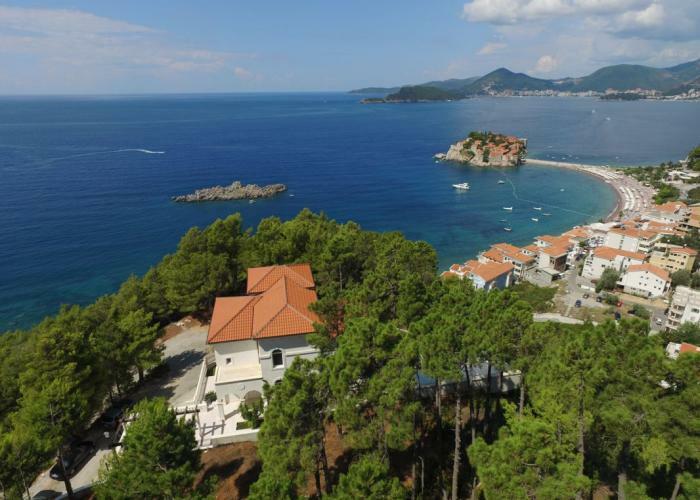 -Panoramic view of the luxurious island-hotel Sv.Stefan with its beaches. covered by natural Quarare Italian pink marble «SERPEGIANTE» . -All floor space covered with “SERPEGIANTE” marble is independently electrically heated. -Flooring in the guest room is high grade bamboo flooring. -3 bedrooms, each with its own bathroom and space for walk in wardrobes American style. -All bathroom floors are independently electrically heated. -All sanitation is high quality VILLERY %26 BOH. -Hall floor is covered in Italian pink marble «SERPEGIANTE» . -Flooring in bedrooms is high grade bamboo flooring. 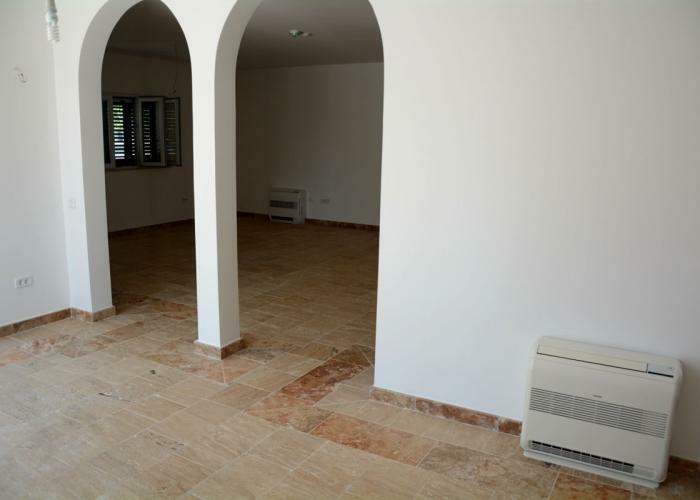 -Large master bedroom with 2 entrances. - Large 20sq.m. area for walk-in wardrobe American style. 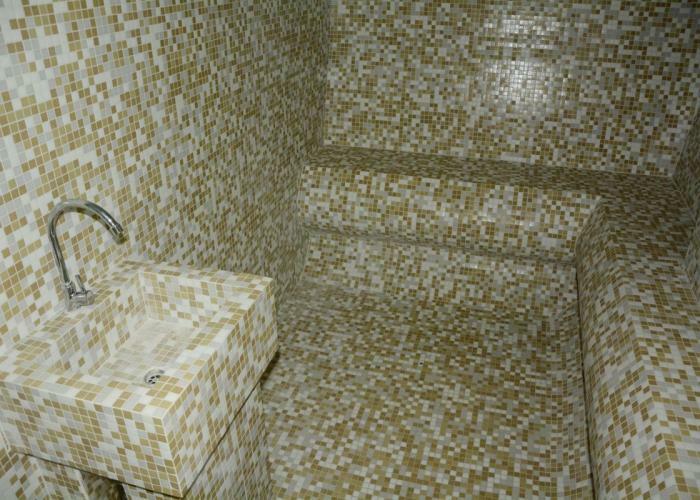 -Large bathroom with 2 sinks, shower. Jacuzzi and electrical towel dryer. 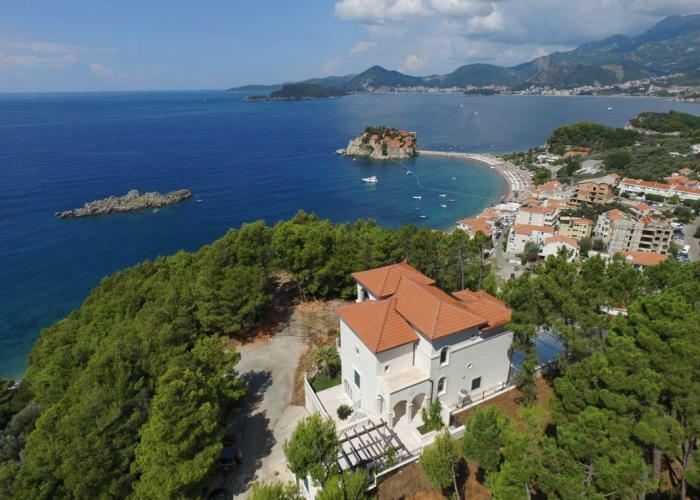 -Access to the large covered arched colonnaded terrace facing south, east and west, with a magnificent view of the open sea, the bays of Budva and Becici, the city hotel of St. Stephen and the surrounding pine and birch trees. -Flooring in the bathroom and toilet rooms is independently electrically heated. 1. 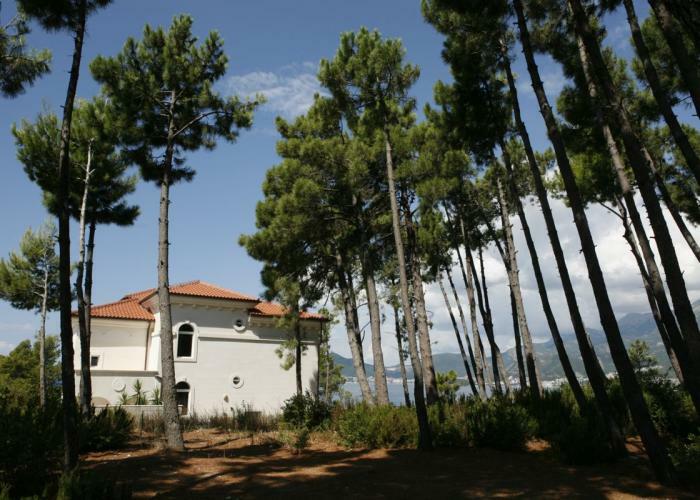 The Villa is located in a pine and birch forest on a plateau 70 m. above sea level, approx. 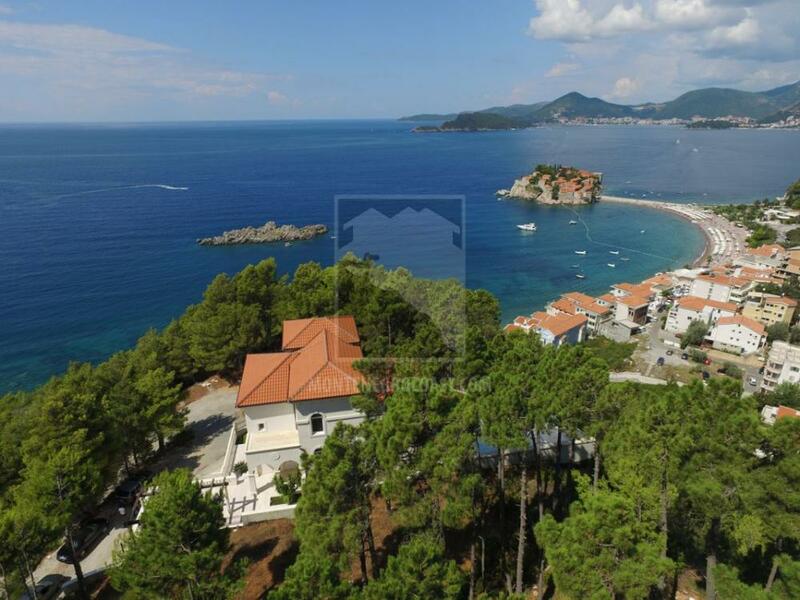 150 meters distant from the sea and to the left of the luxury island hotel of St. Stephen. It has a direct view of the sea, the island-hotel , Budva, Becici and the surrounding forest. 2. 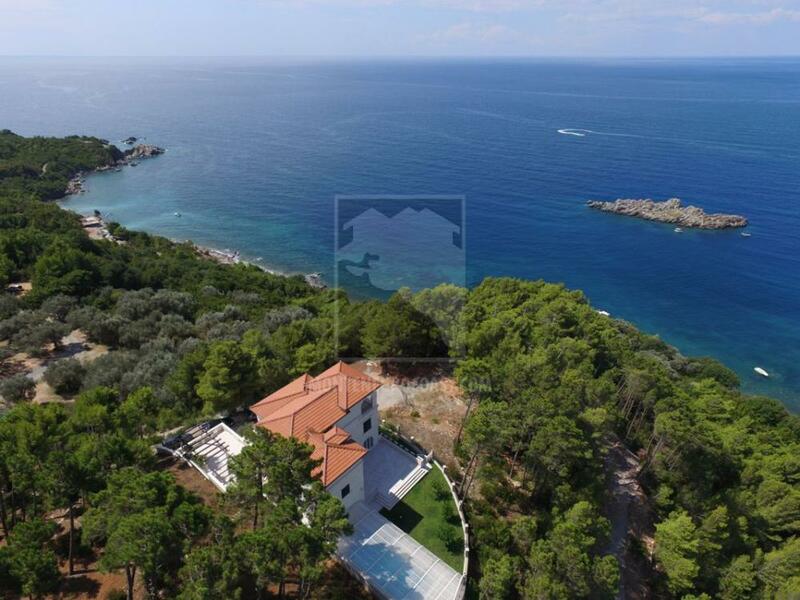 The Villa is accessed via a local asphalt road directly leading to the 200m distant main coast line road. 3. 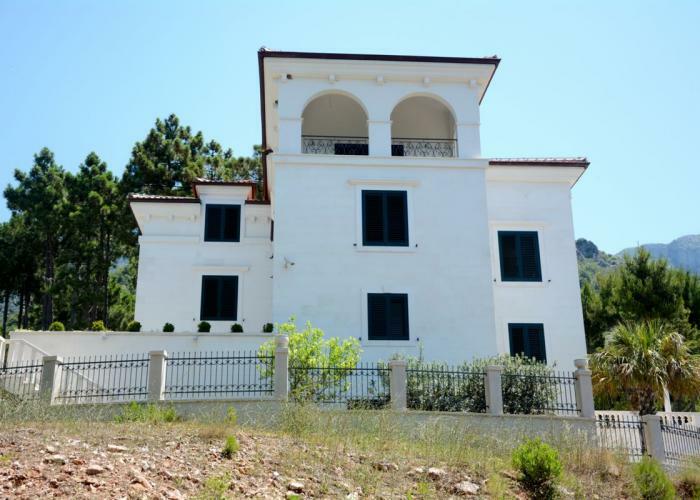 The Villa is designed in the style of Tuscan palazzo (palace), with abundant marble details and decorations. 4. 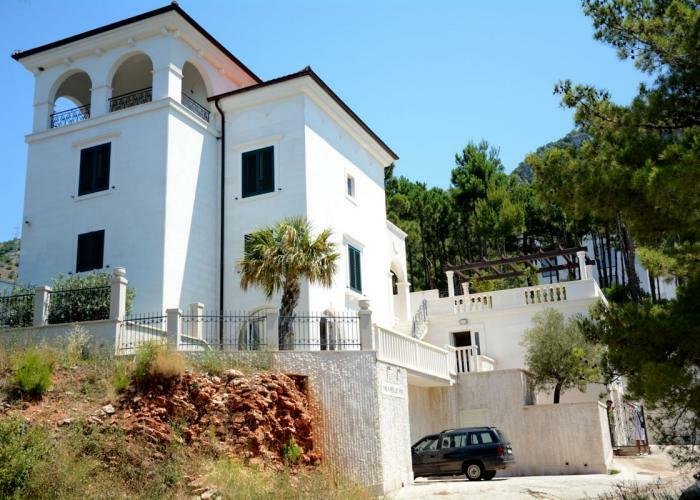 The façade of the Villa is covered in the famous white marble from the Croatian island of Brac (the same marble decorating the façade of the White House in Washington, DC). 5. 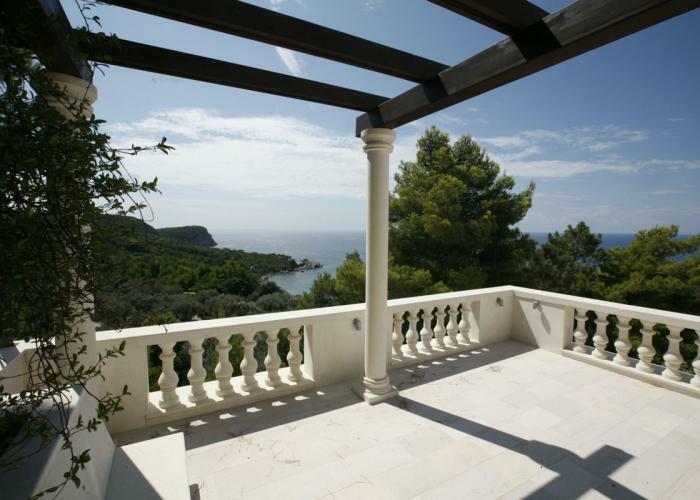 All the decorative and functional details of the facade, such as: supporting ring of the roof, the columns and balustrades on the balconies, terraces and patios, details of window and door frames are all hand made from solid pieces of processed white marble from the island Brac (Croatia). made of Italian (anti slip) white marble «DOLIT». 7. Atmospheric water-rain drains around the perimeter of the roof are made of pure copper. 8. The complete roof is covered with red tiles, type Mediterranee. 9. All the windows and exterior glass doors are of white PVC reinforced plastic frames with 2-chamber vacuum thermal insulation and UV protection, manufactured by the German company SALAMANDER. 10. 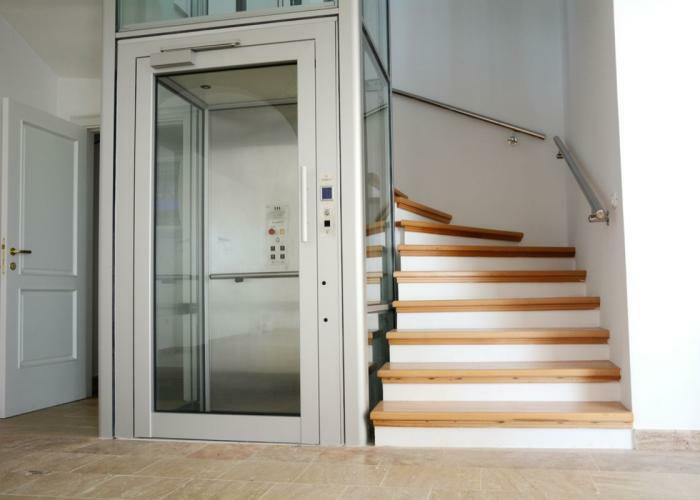 All windows and exterior doors are equipped with green aluminum shutters. In addition all windows are equipped with roll-down mosquito nets. 11. 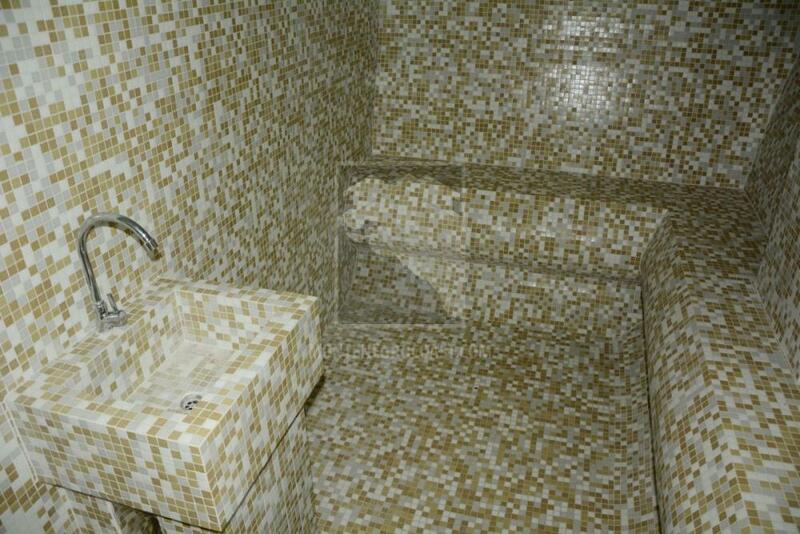 All flooring and wall tilling in bathrooms and toilets are highest grade ceramics of Italian and Spanish producers. 12 All sanitation utensils are highest quality made by the German company Villeroy Boch. 13. All decorative grilles and railings on French windows, terraces, outdoor stairs and outer fence area made of high grade forged iron. 14. All interior doors are white polished and made of oak massive and MDF plates with 3 layers of protective lacquer. All hinges are hidden in door frames. 15. Central air conditioning with room fan-coil units is manufactured by the Japanese firm “Toshiba” with an outdoor central VRV station. 16. All the electrical units of the independent marble surface heating system are manufactured by the Danish firm DEVI. 17. 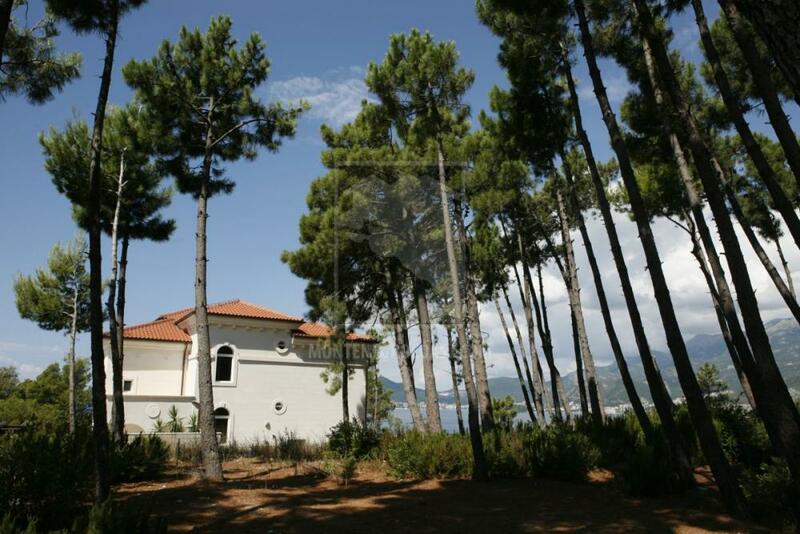 The Villa is equipped with a central unit for water filtration. 18. 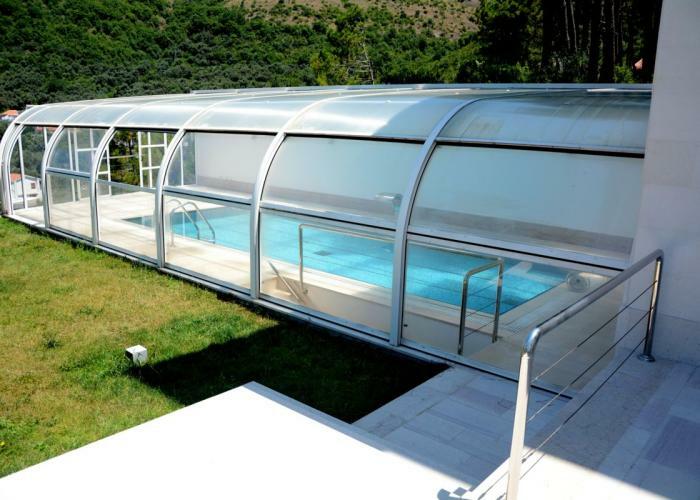 The dome of the outdoor swimming pool is transparent, with an aluminum construction produced by the Spanish firm «VEGA METAL», model VEGA LINE BACK TO BACK SLIDING with front panels sliding open for summer usage. 19. 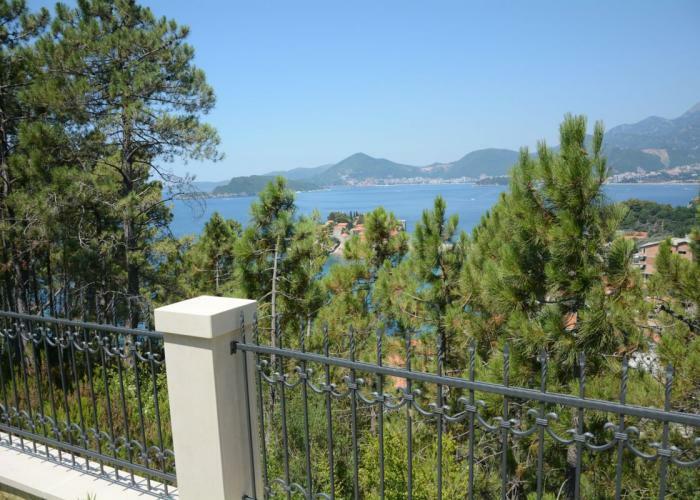 The entire outer hydro and thermal insulation of the Villa is realized employing system TERMOZOL, possessing German certification. -HD Cable TV with numerous international channels. -SAT TV signal distributed in all premises. -Outdoor video surveillance with 6 cameras and DVD recording for 30 days. The central multiple screen is positioned in servant/security apartment and in villa proper. 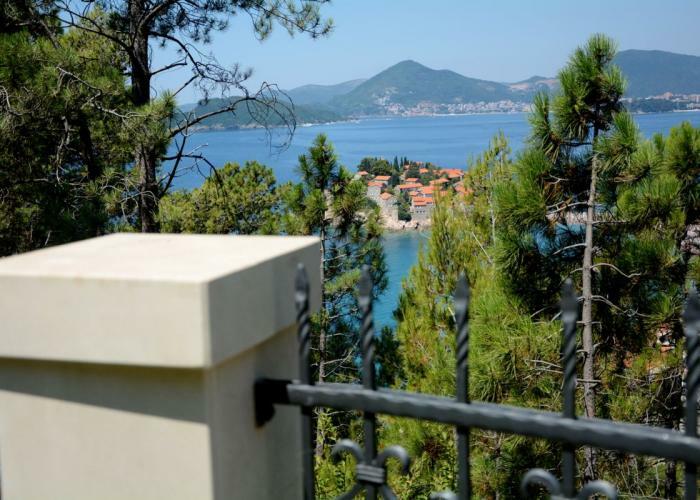 -Alarm system against unauthorized access to villa on the basis of motion sensors. -Fire protection of all premises. -Central computer control system recording up to 1000 events. -Remote internet access and monitoring of all systems in real time.